The Make the Connection! 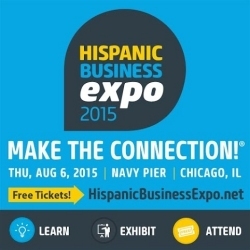 Hispanic Business Expo will take place on Thursday, August 6th at Chicago’s Navy Pier from 10 a.m. to 5 p.m. The Hispanic Business Expo is one of the premier Hispanic business events in the country. In one day thousands of corporations, government agencies and Hispanic-owned businesses will network, build relationships and ‘make the connection.’ With more than 5,000 attendees, the Expo affords entrepreneurs the opportunity to learn about new and exciting trends, ideas and tools that will fundamentally change the way they approach their businesses and lives.